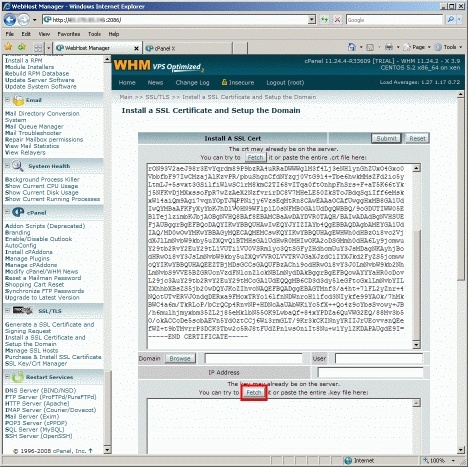 How Do I Install an EV SSL Certificate on cPanel or WHM? Extended Validation SSL Certificates, also known as EV Certificates, provide the strictest validation requirements to prove to your customers that your site is not a phishing or fraudulent website.The addressbar is in green to show customers that it issafe to proceedon your website. 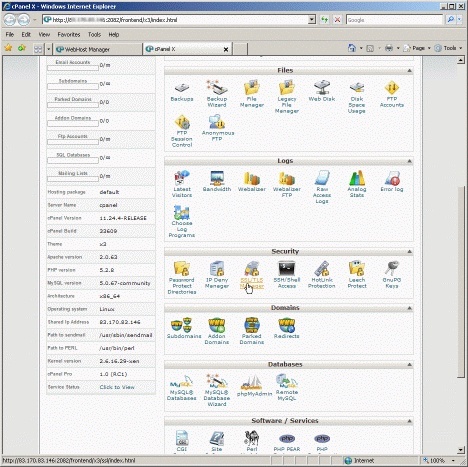 To install your certificate, you will need to log into your cPanel® or WHM® account. 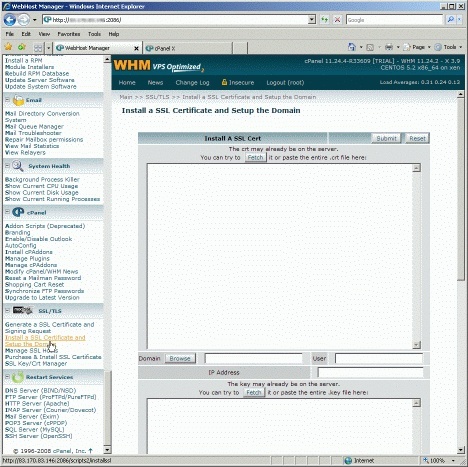 Both cPanel (the end-user control panel) and WHM (the administrator panel) have slightly different ways to install certificates. You will have received your certificate from us, a file typically named our_domain_com.crt as well as the CA bundle file containing the intermediate certificates, typically named Apache_Plesk_Install.txt. 1. Log into WHM. From the menu, navigate to the SSL/TLS section, then click Install a SSL Certificate and Setup the Domain. 2. Open the certificate file in a text editor (this is the file with your domain in the filename)and copy and paste the contents into the top box. 3. Click the second Fetch button near the key file section. This will retrieve the private key and domain, user and IP address information from the server and populate it into the form for you. 4. Scroll down to the bottom of the form. You will see a box labelled Paste the ca bundle here (optional). 5. Open the ca-bundle file and copy and paste the contents into this box. 6. 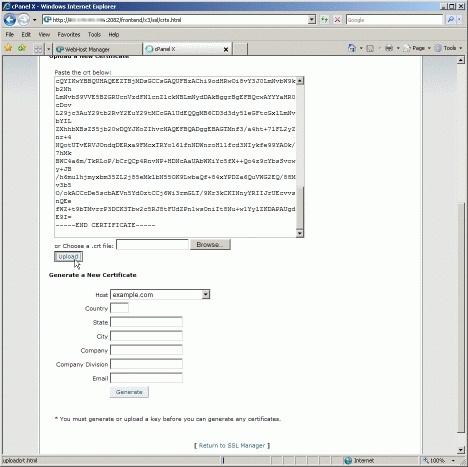 Click the Submit button, and after a minute or two the certificate will be installed and set up on the domain. See notes below if you did not receive the ca-bundle file. 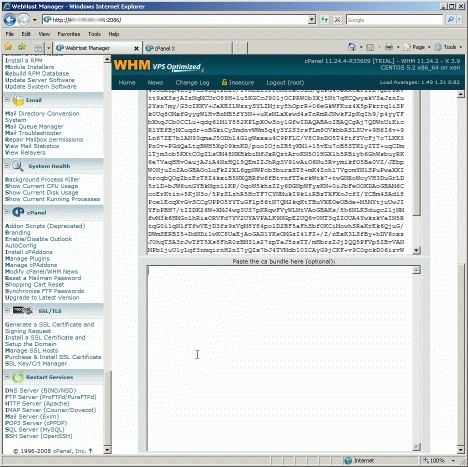 You have installed your EV SSL Certificate usingWHM. 1. Log into cPanel. Under the Security menu, click the SSL/TLS Manager. 2. Click the bottom link for Certificates. 3. In the box that reads Paste the crt below:, copy and paste the contents of your certificate file (typically named your_domain_com.crt). Alternatively, you can upload it through the browser. Click the Upload button. The certificate will get uploaded and installed to the site. You have installed your EV SSL Certificate usingcPanel. Note: If you did not receive the ca-bundle file, it can be constructed from the intermediate certificate(s). Simply create a new text file, and copy the contents of the intermediate certificates into it, one after another. Copy them in order, top-to-bottom: UTN-USERFirst-Hardware.crt and AddTrustExternalCARoot.crt. How Do I Install an EV SSL Certificate on Apache (with mod_ssl) and OpenSSL?